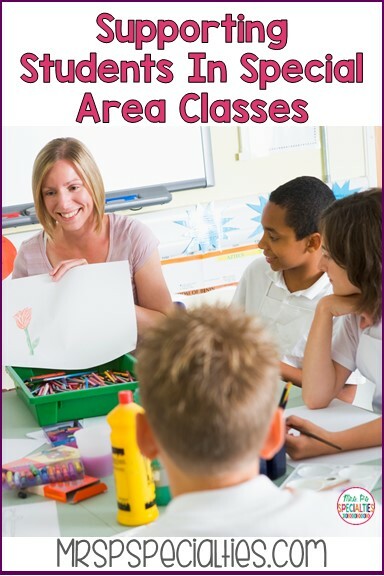 Supporting Students In Special Area Classes | Mrs. P's Specialties! Regardless of the reason, put yourself in their shoes. Your student hasn't attended specials before or he did and it didn't go well. Students are often anxious and unsure of what to expect, what they will need to do, etc. 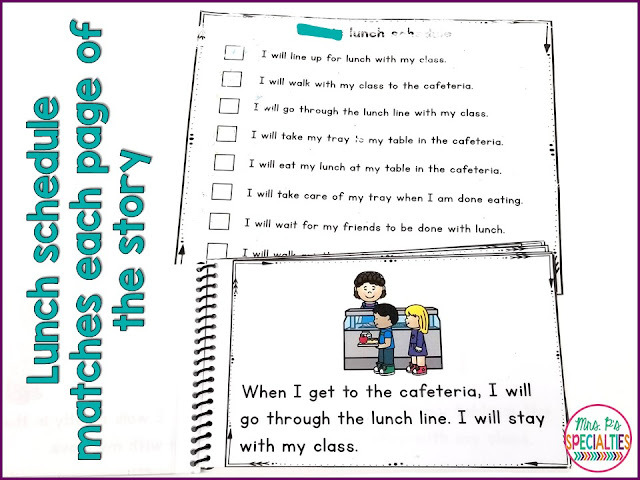 To help the student feel calmer and better prepared, we write a social narrative or script of what the student is going to do, what will happen etc. It does not have to be fancy! Many times it is me just writing a couple sentences on paper like the one below. Other times, it is a more detailed, step by step, script. For the one below, we also had a checklist to keep the student on track during lunch. It's also helpful for making sure everyone is on the same page... paras, students, aides, etc. 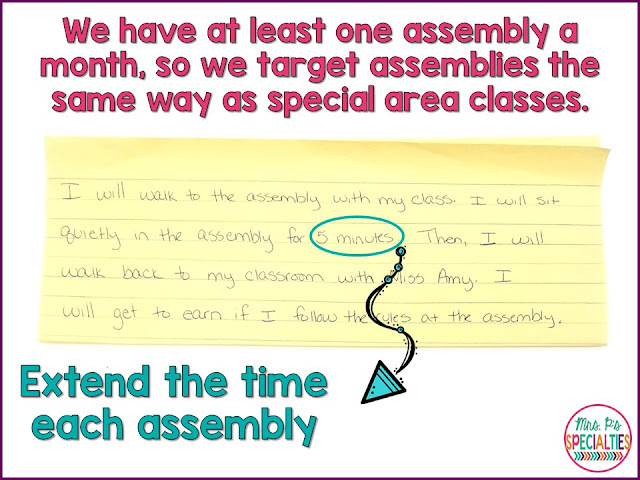 If students haven't attended special area classes before or for a long time, we add a time limit. We start with very short times to make sure that the student is successful. For example, a student may only need to attend art class for 2 minutes. When the timer goes off, the student comes back to the classroom and gets to do a reinforcing activity... this reinforcer was listed in the social narrative. We don't want any surprises! We want everything to go smoothly and just as it was listed to build trust between the student and adults. As the student successfully attends and participates in the special area classes, cafeteria, etc., we begin changing the time in the narrative to build stamina (written in pencil so we can keep changing it). We usually increase the time by 2 to 5 minutes each class, but that is dependent on how well your student is doing. 1) Problem: Our student was being successful, but is now having trouble in specials. Answer: You may have increased the time by too much. Try going back to the last time length that he was successful with. Once he is successful again, increase by smaller increments. 2) Problem: My student doesn't want to give me the narrative back and I'm sick of re-writing it. Answer: Make a copy that the student can keep. 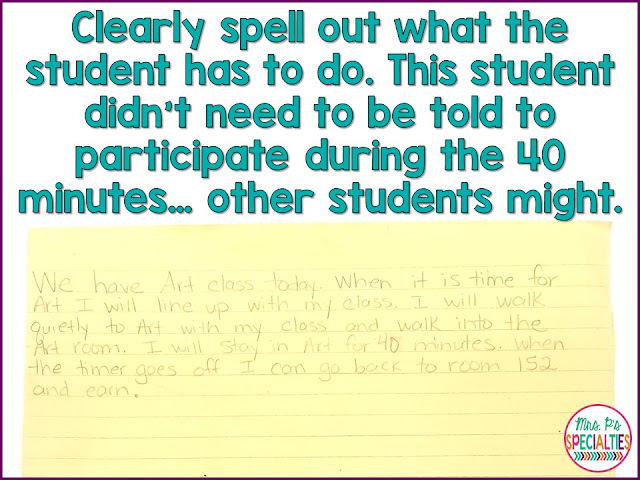 3) Problem: My student just wants to stare at the timer and doesn't participate in the class. Answer: Add a sentence in the narrative stating where the timer will be and what the student should be doing. For example, "In P.E.,the time will be on Coach's desk. I will sit with my class and do 4 warm up exercises. When the timer beeps, I can take the timer back to my classroom and read books on the carpet. 4.) Problem: How long will it take to get the student to go to specials/cafeteria? Answer: That depends on how fast your student handles the increases in the timer. I have had student who are able to quickly increase the time and others who took about a month before the student was able to attend and participate for the entire special area class. Don't forget to pin this post so you can easily refer back to it. If you have a question that hasn't been answered here, leave me a comment. This is such a very important topic. I agree with all your suggestions, but wanted to add that you should expect regression when the support (para) staff changes. It seems my student associate the special activity with a specific person and resist going if that person isn't present.